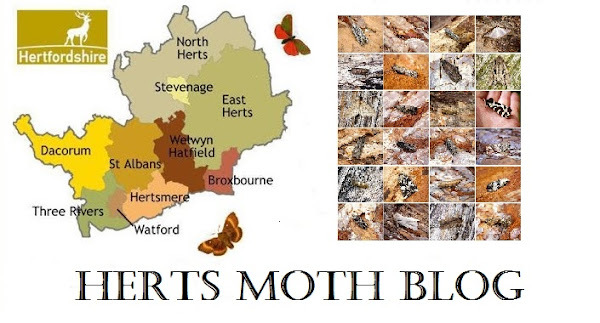 I've been pretty lazy lately updating my blog and so here is a combined list of moths including all of the new for year species since the 22nd of July until the 30th. In the time I trapped 4 times and each time the catch has got slightly lower each time. This slow down I usually expect to see at the end of August, but with species such as Square-spot Rustic, Rosy Rustic and Straw Underwing it kind of feels like that time of year already. Some great new moths for the year last week including the rarely seen Nutmeg (with just 3 records now for the garden and last seen in 2014). Nutmeg is a strange one for me. It seems to have poor years for about 5 or 6 consecutive years then an explosion happens like in 2012 where I trapped no less than 220 over two traps on the farm at Braughing Friars. Also Ypsolopha scabrella, which was a garden first in 2013 returned after a four year absence and not just one but 4 over the week and all different specimens as they were potted up. Udea ferrugalis was recorded as well, a migrant that has turned up for the last 5 years running and my earliest garden record by 29 days, I actually caught two of them on different nights which was pleasing. Last week saw a spurt of migrants with a year first Nomophila noctuella also recorded and no less than 35 Silver-Y's over the week. Unbelievably I missed out on Copper Underwing last year, a common moth and which was a year first on the 28th of July. But saving the best until last was a new Macro Moth for the garden and a truly un-welcome visitor if you work for DEFRA, the Oak Processionary Moth. Really pleased to trap this presumed wanderer from it's stronghold population in the Thames Valley and in many districts of London. Unfortunately, it was in a pretty dire state but it still counts and I believe only the second record for Hertfordshire. So I need 9 species to level with the best year in 2014, that should be easily attainable with about 20 common species 'expected' to turn up before the year ends. That is all for now... back to trapping for me. Hi Andy. Nope I don't think it is. Worn Nut-tree Tussocks can look very similiar though! I hope you have one as well.